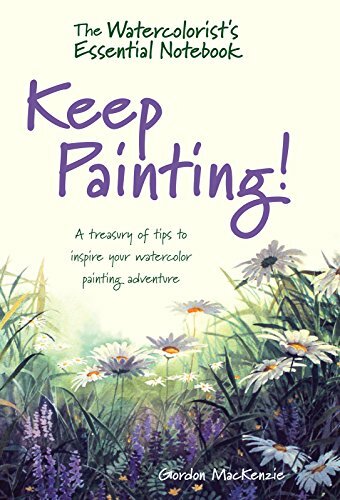 Gordon Mackenzie's new book Keep Painting! from The Watercolorist's Essential Notebook series is a wonderful collection of tips, techniques and ideas for anyone who uses watercolour. His previous book, The Complete Watercolorist's Essential Notebook is a beginner's book for learning the basics of watercolour painting. This new book is sort of a complement to that book. It talks about creativity and different ways of thinking about painting, drawing, using colours, composition. These are new tips and there aren't any duplication in content. This 144-page hardcover can be turned to any page and read, and a book worth revisiting once in a while. There are tutorials you can follow and beautiful illustrated examples. The book has quite a lot of text and all that is good information. It's worth the money and deserves to be on the shelves of anyone who loves watercolour and want to explore the medium more.